Your windows represent a significant potential home energy sink. Traditional single-pane windows allow heat to easily transfer between your home and the outside world, increasing the costs of heating your home in the winter and cooling your home in the summer. 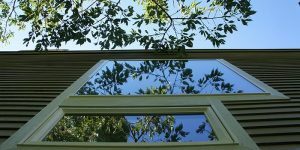 Energy-efficient windows solve this problem by employing several different techniques to cut down on energy transfer through your home’s windows, including the use of multiple panes, reflective coatings, and insulating frames to keep your home comfortable at a lower cost.